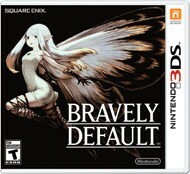 The latest trailer for the upcoming 3DS RPG, Bravely Default: Flying Fairy, details some of the game's job mechanics. A demo for Bravely Default will give players a leg up on the full game. Square Enix and Nintendo UK recently tweeted out an image showcasing everything that will be included with the Deluxe Collector's Edition of Bravely Default. The newest trailer for the game shows off your party members and sheds a little light on their backstories. Bravely Default is coming to North America in 2014, but the first English trailer is here today.